This page provides a brief overview regarding the Republican River basin within the state of Kansas, including regulations on water use within the basin, a brief description of water resource agencies and programs, and contact information. 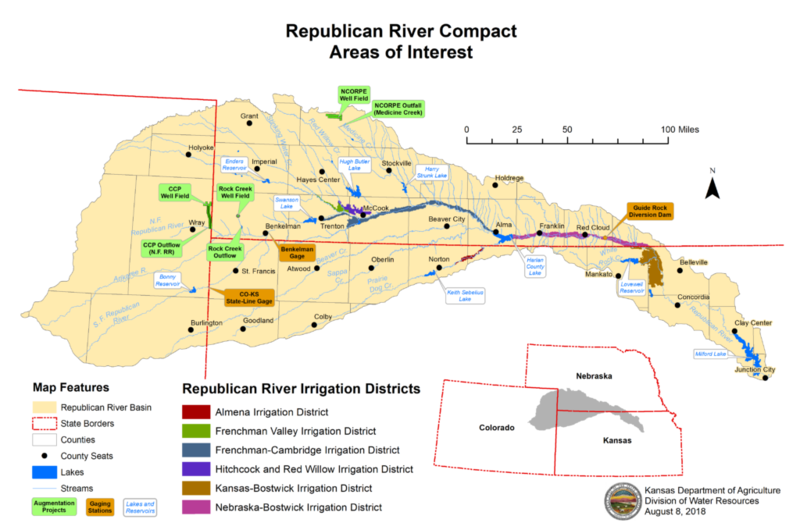 More detailed information regarding the Republican River in Kansas can be found on the Kansas Department of Agriculture-Division of Water Resources-Republican River Compact website and in links below. See Kansas Compacts for a map of all the compacts that Kansas is party to. Groundwater and surface water rights in the upper Republican River tributaries of Northwest Kansas, including the South Fork of the Republican River, Sappa Creek, Beaver Creek, Prairie Dog Creek and the Almena Irrigation District. The Kansas Bostwick Irrigation District in North central Kansas, which represent approximately 40,000 acres irrigated from the Republican River. Groundwater and surface rights along the Republican River mainstem from the Nebraska-Kansas state line in Republic County, KS to Milford Lake in Clay and Geary counties. Milford Lake and downstream users on the Kansas River. Groundwater and surface water resource development and use in Kansas is governed by the Kansas Water Appropriation Act, in a single priority system. The State of Kansas closed northwest Kansas to new appropriations of water in the early 1980’s, allowing it to keep its use within the allocations provided by the Compact and as further defined by the 2002 Final Settlement Stipulation (FSS). The State of Kansas has agencies involved in water resource development, use, planning and policy. Below are links to those partners along with a brief description of the agency or organization. Kansas Department of Agriculture – Division of Water Resources. The Division of Water Resources administers 30 laws and responsibilities including the Kansas Water Appropriation Act which governs how water is allocated and used; statutes regulating the construction of dams, levees and other changes to streams; the state’s four interstate river compacts; as well as coordinating the national flood insurance program in Kansas. Follow this link to the Kansas Republican River Fact Sheet (January 2017). Kansas Water Office. The Kansas Water Office (KWO) and the Kansas Water Authority (KWA) were established in 1981. The KWO is the water planning, policy, coordination and marketing agency for the state. The primary statutory function of the agency is the development and implementation of the Kansas Water Plan. KWO in coordination with the KWA, also reviews all water laws and makes recommendations to the Governor and Legislature for needed legislation to ensure water policies and programs address the needs of all Kansans. Follow this link to the Kansas 50-Year Water Vision. Northwest Kansas Groundwater Management District No. 4. This district covers lands underlain by the Ogallala Aquifer within northwest Kansas including portions of the tributaries to the Republican River. The purpose of the district is to promote the proper conservation and management of the groundwater resources and within its boundaries within state law and policies. The district provides local land owners and water users with the ability to be involved in the process by establishing their own regulations regarding the resource and to assist in directing research and education activities. The official in the State of Kansas responsible for carrying out the duties of RRCA commissioner is the Kansas Department of Agriculture-Division of Water Resources Chief Engineer, a position currently held by David Barfield since 2007. The RRCA Engineering Committee is a standing committee comprised of a representative from each state appointed by the state’s RRCA Commissioner. The committee position for Kansas is currently held by Chris Beightel. See the Kansas Department of Agriculture website for contact information.